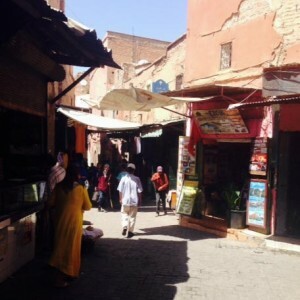 Although Marrakech is famous for the shops and stalls of the Souks, every single alleyway, derb or street in the red city is filled with wonderful shops. These shops range from unique boutiques selling handmade jewellery, woodcraft items or leather shoes to more standard ‘newsagent-style’ shops selling water, drinks and confectionary. The frequency of these Newsagent shops are very useful to visitors of Marrakech: the hot Moroccan sun means you always need a new bottle of water, and the frequency of the shops mean that you are always 5m away from a refreshing drink. However, it is the small, independent boutiques, selling unique and handcrafted items, which are so unique to Marrakech. Perhaps the best way to explore these hidden gems is by strolling around the Medina and entering shops that take your fancy. However if you are interested in a bit more structure then download our free Hip Marrakech app from the AppStore which features a map and guide including suggested shops and four craft-themed medina walks – Iron and Clay, Leather, Needle and Thread and Woodworking – that guide you through hidden workshops and past the local shops selling the products. Either way you experience the unique small shops of the Medina, our top tip is to be careful what you pick up: although all of the local shop owners are very friendly, they are also very good sellers and you may be convinced to buy something that you may only be interested in!! This entry was posted on Sunday, September 7th, 2014 at 9:16 pm	and is filed under Marrakech, Photo a day. You can follow any responses to this entry through the RSS 2.0 feed. Both comments and pings are currently closed.